Offer is valid only in Ghaziabad. Columbia Asia Hospital Ghaziabad is a multispecialty hospital located in an important area of the National Capital Region. The 100 bed hospital has been operational since September 2010 and is designed to cater to the daily needs of patients, from childbirth and internal medicine to minimally invasive surgeries and orthopedics. Columbia Asia Hospital Ghaziabad has highly qualified medical personnel, technicians and support staff to ensure the highest quality of care. It has full time specialists in Obstetrics & Gynecology, Internal Medicine, General Surgery, Pediatrics, Ophthalmology, Ear, Nose & Throat, Urology, Gastroenterology, Orthopedics, Dermatology, Dental and Plastic Surgery.The hospital follows globally benchmarked standards of medical, nursing and operating protocols. Electronic Medical Records Management and Customer Care management considerably reduces waiting time at the hospital and enhances the quality and efficiency of managing patient records. The facility is already recognized as one of the best hospitals in Ghaziabad. 2. Valid at Columbia Asia Hospital, Ghaziabad. 5. Package Inclusion: CBC WITH ESR, BLOOD SUGAR, TOTAL CHOLESTEROL, LIVER FUNCTION TEST, KIDNEY FUNCTION TEST, PS (PERIPHERAL SMEAR), URINE ROUTINE & CONSULTATION WITH DOCTOR. 6. 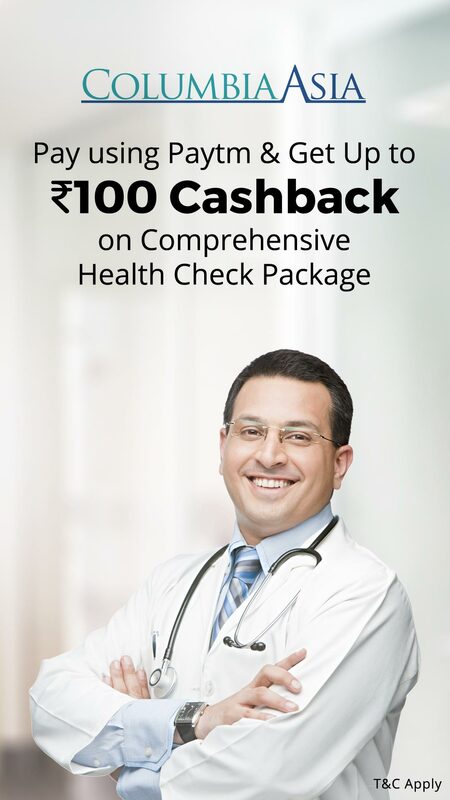 Comprehensive health check up (under 30 years) worth Rs.1199.